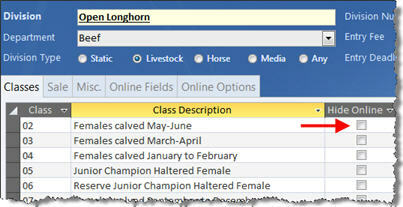 Some or all divisions and or classes do not appear in the drop down menus for online entry. 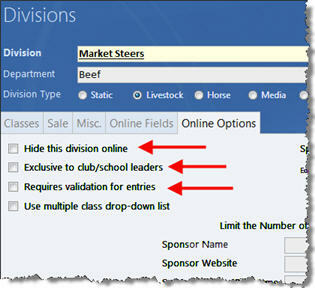 The division(s) not showing up, are marked as "Hide this division online"
The division(s) not showing up, are marked as "Exclusive to club/school leaders"
The division(s) not showing up, are marked as "Requires validation for entries"
The class is marked as "Hide Online"
The division has the Class field marked as "Hide"
After following the solutions below, one should check the "obvious" which is that they have sucessfully "uploaded" their data file after any changes are made. If the online information does not match what you find locally in your ShoWorks data file, then you have either not uploaded your data or changes, or uploaded your data into the wrong account (if you have multiple online entries accounts). The checkboxes to determine the hidden status of any given division can be found in the Divisions menu under the "Online Options" tab for that particular division. Use the division navigator at the right of the menu to locate the division in question and observe the following screen display. A check in any one of the three boxes will cause a division to be hidden. Using the explanations below, make sure that you have not inadvertently checked one of the boxes and if so, uncheck the box for this and any other divisions that do not show up online. Then make sure to upload your data file again (this will not have any adverse effects even if you have already begun taking online entries) for the changes to take effect. Hide this division online – used to hide a division that you do not want people to enter into online. You may turn on and off this checkbox throughout your online session to control entry as needed. Exclusive to club/school leaders – used to prevent anyone from entering in this division unless they are first logged in as a Club or School. Requires validation for entries – used to hide the division until an exhibitor first logs on to the website and this exhibitor has already entered prior entries in this division and those entries have also been uploaded. See the help article on "Using Validation or Nominations to control the online entry process". 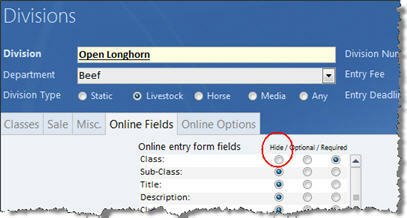 A class may be hidden by checking the box "Hide Online" in the Divisions menu for that given class. Classes will also not show up if the field status is marked "Hide" for that given division. Make the appropriate changes and then make sure to upload your data file again (this will not have any adverse effects even if you have already begun taking online entries) for the changes to take effect.